Manila, Philippines - Weather bureau PAGASA on its latest weather forecast as of 7:00AM, July 16, 2014, said that 'Typhoon Glenda' with international name of Rammasun accelerates while maintaining its strength. At 7:00 AM today, the eye of Typhoon 'Glenda' was located based on all available data and Subic Radar Station at the vicinity over Imus, Cavite (14.4N,120.9E). 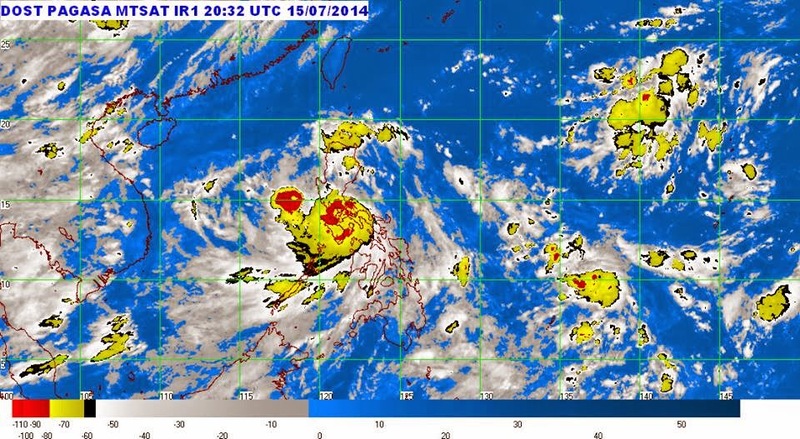 It has maximum sustained winds of 150 kph near the center and gustiness of up to 185 kph. It is forecast to move West Northwest at 26 kph. Typhoon “GLENDA” is expected to cross Metro Manila early this morning and exit landmass via Zambales by noon today. By Thursday morning, it will be at 190 km West of Dagupan City and at 580 km Northwest of Dagupan City or outside the Philippine Area of Responsibility (PAR) by Friday morning. Metro Manila, CALABARZON, Central Luzon and the Provinces of Mindoro, Camarines, Albay, Romblon, Pangasinan, Nueva Ecija, La Union, Benguet and Southern Aurora will experience stormy weather. The provinces of Ilocos Sur, Nueva Viscaya, Quirino, Catanduanes, Sorsogon, Masbate, Rest of Aurora and Ticao Island will have rains with gusty winds and the coastal waters along these areas will be rough to very rough. The rest of Luzon and Visayas will experience cloudy skies with light to moderate rains and thunderstors. Mindanao will be partly cloudy to cloudy with isolated rainshowers or thunderstorms. PUBLIC STORM WARNING SIGNAL #3 (Winds of 101 -185 kph is expected in at least 18 hrs): Pangasinan, Zambales, Tarlac, Pampanga, Bulacan, Bataan, Quezon including Polillo and Alabat Is., Rizal, Cavite, Batangas, Laguna, Marinduque, northern part of Mindoro provinces including Lubang Island and Metro Manila. PUBLIC STORM WARNING SIGNAL # 2 (Winds of 61-100 kph is expected in at least 24 hrs): La Union, Benguet, Nueva Ecija, Southern Aurora, Camarines Norte, Camarines Sur, Albay, Burias Island, Romblon, rest of Oriental and Occidental Mindoro. PUBLIC STORM WARNING SIGNAL #1 (Winds of 30-60 kph is expected in at least 36 hours): Ilocos Sur, Nueva Vizcaya, Quirino, rest of Aurora, Catanduanes, Sorsogon, Ticao Island and Masbate. PAGASA advised that public storm warning signals elsewhere are now lowered. Residents in low lying and mountainous areas under signal #3, #2 & #1 are alerted against possible flashfloods and landslides. Likewise, those living in coastal areas under signal #3 and #2 are alerted against storm surges of up to three (3) meters. Estimated rainfall amount is from 7.5 – 30 mm per hour (heavy - intense) within the 500 km diameter of the Typhoon. Fishing boats and other small seacrafts are advised not to venture out into the Eastern seaboards of Luzon and of Visayas. The public and the Disaster Risk Reduction and Management Council (DRRMC) concerned are advised to take appropriate actions and watch for the next bulletin to be issued at 11 AM today.